And now, for something totally different. A cross country race in the snow. I’m not expecting to run very fast this morning. Grass is considerably slower than paved roads. Not that there is much grass visible on today’s course. The course is buried under a few inches of ice and snow. The weather isn’t too bad. It’s snowing and under 20°, but there is very little wind. Cold air is fine for running – without wind. I studied my previous two runs on this course at Harlow Platts Park from January and last November. I was in similar shape but only averaged a 7:22 and 7:38 pace respectively. I find it difficult to believe I couldn’t manage a sub-7 minute pace for such a short distance. My thought is the course cannot possibly impact my pace that much. I suspect the race scenario results in too much of a sprint at the start. My first mile isn’t too fast, but my first quarter mile is. Probably, simply my first 100 yards. So my race strategy this morning will be to crawl off the starting line. This might have implications later trying to pass other runners, but I’ll take the risk. It will be a good experiment if not a winning strategy. Not that I’m going to win anything today. I can’t place in cross country without a team. And a large number of these runners are fairly elite. But it’s not about winning. I get a kick out of lining up with these hotshot harriers. I realize any thoughts on running fast or race strategy is moot once I begin my warmup. Running over this snow is hard. I was hoping for a snowpack but this is loose powder. Traction is poor. The course has been snow-plowed. This helps to follow the path but does little to help with footing. 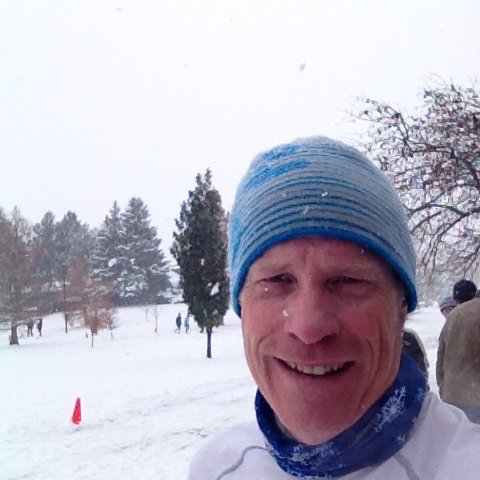 I talk with another runner who tells me his spikes don’t help because the snow is too powdery. I’m running in my New Balance trail flats. Wish I had spikes. Long ones. This is going to be a slow race. My new strategy is to simply avoid being lapped by the elites before I complete my second loop. It’s a three loop race over four miles. I line up in the back with a few older guys. The field looks like about 50 runners of various ages. There’s a team of 70 year olds and a couple of 80 year old runners. I would tell you I run to plan by starting off slow, but it’s impossible to run fast in these conditions. The hills are made exceedingly difficult by the snow. I count five hills, all short in length but extremely taxing. Kids are sledding down the largest hill. Traction is so poor I actually can’t tell you how I manage to climb it. I think I will myself to the top on each loop. Spikes would really help for this hill. If these conditions are not bad enough, bales of hay are stacked at one spot on the course. Apparently positioned just before the race start because I didn’t see these during my warmup. This is insane. I complete my first mile in 7:53 and feel strong with my breathing but still can’t run any faster. I run mile two similarly in 7:56. Nice even pace. This gives me the energy to push my third mile. Running hard on the third quarter of any race, regardless of distance, is my typical race tactic. We’re so spread out, I only pass one runner. I do run faster though in 7:45. I finish my final mile in 7:57 for an average 7:52 pace for the 6K. I feel good afterward but not sure this qualifies as a race. Still, glad I got out. And the elites didn’t come any where close to lapping me. Always good to not get lapped. I meet up afterward with Brit and Ellie, and Brit’s boyfriend Forrest, for lunch at Sushi Hapa. We follow that up with some browsing at the Boulder Bookstore. Not a bad snow day.